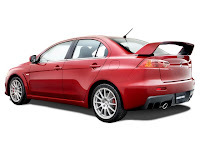 There are 2 types of Lancer Evolution X the top of the line is the Lance Evolution MR X, this ugraded model MR includes the new Twin Clutch Sportronic Shift Transmission (TC-SST), Eibach springs and Bilstein shock absorbers, lightweight brake rotors and BBS forged-alloy wheels, and extra sound insulation, as well as optional navigation, upgraded audio with Sirius Satellite reception, and leather seats. 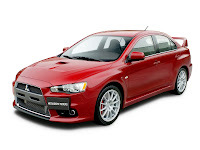 Lancer Evolution MR power and engine is the same as the GSR it has the new all-aluminum 2.0 liter turbocharged four-cylinder MIVEC4 motor producing 295 horsepower and 300 pound-feet of torque and Super All Wheel Control (S-AWC) drive system. 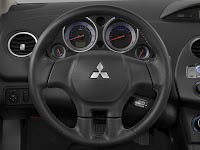 Lancer Evolution MR adds the Twin Clutch SST, even and odd gears are on separate clutches for rapid-fire shifting and no torque loss between gears, this means that there are almost no gap or it almost doesn't downgrade your speed while shifting gears, Shifting using the Twin Clutch SST is controlled by paddles on the steering wheel, Lancer Evolution MR has 3 modes: Normal, Sport and S-Sport, the latter providing the most aggressive, fast shifts. A car known for its power the Mitsubishi Lancer Evolution X , just like what I said in my previous article about Eclipse GS Lancer Evolution X or Evo's are made to compete in a race track, while in terms of design it is just like a normal lancer that has been body kitted, I can say this is not my kind of car unless I was going to enter into a race, but for a normal person "not a racer" with Lancer Evolution x price you could get other car that would satisfy you much more because they have highly great design and comfort with a fairly good speed that is just right for the roads outside your home. 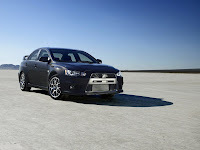 But for the Lancer Evolution X lovers this car is great actually in terms of its power, there are two types of Lancer Evolution X, GSR and MR the entry level GSR has a 5 speed manual Transmission Recaro Sport seats Enkei wheels and an optional spoiler, HID headlights and ugraded sound system. 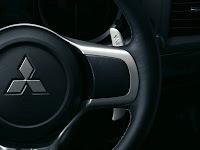 Lancer Evolution X safety features include the Reinforced Impact Safety Evolution (RISE) unibody system to disperse energy in front and side impact collisions and protect the fuel system from rear impact, and front and side impact air bags, plus a driver's knee air bag. One of my favorite car the Mitsubishi Eclipse GS do you know why? because this car Eclipse GS has a nice aero dynamic exterior design and the interior is also great definitely the seats, this car is not all about power only, that is one of the reasons why I like this Eclipse GS, unlike Evolutions that is only about power, Eclipse GS combines great design and a fairly good speed in comparison to a semi sports car category which is good enough for me, and also one of the good side of this Eclipse GS is this car is by far one of the cheapest sports car like type of car, Eclipse GS was rated 64 green friendly too, so if you're out of budget and you like sports car this Eclipse GS is the car for you. Tire Wheel Diameter: 17 in. One of the perfume in the 80's that I still like, Calvin Klein's Eternity Perfume launch in 1989 it has a refreshing luxury scent combining spicey lavender and amber making it a classy fragrant scent Eternity Perfume is recommended for daytime wear, but for me I recommend it be used anytime even in night times like dates because Eternity Perfume has a classy masculine scent that creates great vibe towards your partner and she'll definitely love it, this Eternity Perfume is great because it has a strong scent that could last for a long time compare to other Eau de toilettes that is. 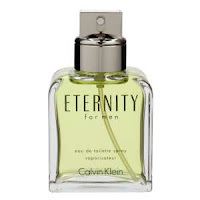 because of those features I still consider this Eternity Perfume for men the number 1 perfume of Calvin Klein until now, nothing they made lately could beat this one. The spear shaped like car BMW Z4 M, aero dynamically optimized designed to keep the car well stabilized and glued on the road like a sports car, BMW Z4 M’s design doesn’t only brings great performance but it also looks great, a very high class and eye catching design that’s my opinion on this BMW Z4 M, I didn’t even expect they've made this design for other purpose than beauty but they did which is great, BMW Z4 M also has an 18 inch alloy wheels and dual tailpipes on each rear side that completes this car making it spectacular. 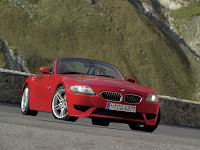 BMW Z4 M has 343 horsepower that has a top speed of 250km/h and can accelerate 0 to 100 km/h in just 5 seconds. BMW Z4 M is a roadster with racing in its genes. Its naturally aspirated straight six engine has been a winner and already been Awarded five years in a row. With an excellent exterior design suitable for everyday use, this BMW 335D has a mixed classy and sporty design, and when it comes to engine performance and fuel consumption this BMW 335D is considered one of the best made. 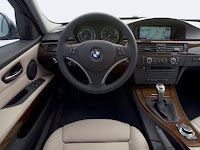 Going head to head with a hybrid cars, this BMW 335D has a twin turbocharged 3.0 liter inline 6 diesel engine, known as the clean diesels, it produces a 265bhp at 3200 rpm and 425 lb/ft of torque, giving you a top speed of 131mph this BMW 335D is considered unbelievably great and it can accelerate 0 to 60mph in 6.0 seconds faster than a Boxster in terms of acceleration that is, and what's more? this BMW 335D's fuel economy, it can achieve 23mpg for city drives and 36mpg for highways, so who needs Hybrid cars now. 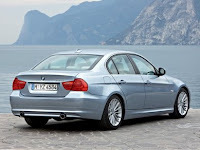 Although BMW 335D needs urea injections every now and then in order to reduce the NOX emissions, and it is required to be refilled every 15,000 miles, but it's not really a big deal since it is covered by BMW's free maintenance program for the first four years, and besides it's only like an additional oil change, and if you look at the bright side on how it consumes fuel over a normal car, with this BMW 335D's fuel economy you're already a winner. By the way you can't ignore the urea injection maintenance in this BMW 335D because you won't be able to start your car if you didn't maintain it. But of course there's a warning on your dash first and if you still continue without maintaining it, then you'll end up not being able to start your BMW 335D. 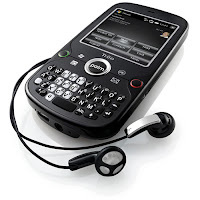 Smart phones are the trends of today, and here is the latest Palm Handhelds Treo Pro, probably the best looking Treo phone and also the best among treo's Palm Handhelds, what's great about this Treo Pro Palm Handhelds is that, it is powered by Windows Mobile 6.1 compare to others with different OS there are a lot of stuff that hassles you, like Excel files you'll need to convert it to be able to edit it on your desktop on the other hand with this Treo Pro Palm Handhelds that uses Windows you can edit it directly without needing to convert it that's just one example but there are alot believe me I've tried an Windows OS Smartphone and a non Windows I've always had those problems. 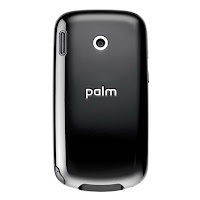 Palm Handhelds Camera: 2.0 megapixel digital camera, 8x digital zoom. (maximum 1600 x 1200 pixel resolution). also supports video mode.